We will look at the bundling and minification techniques available in a .NET4.5 MVC4 project. Bundling and minification help optimise a web page by reducing the number of requests sent to the server and the size of the downloads. I assume most readers will know what the terms mean, but here comes a short explanation just in case. Minification: it is obvious that larger external files take longer to download. CSS and JS files can usually be made smaller by removing comments, white space, making variable names shorter etc. The two techniques applied together will decrease the page load time making your readers happy. These two web optimisation techniques are well-known in the web developing world but they are generally cumbersome to carry out manually. Many programmers simply omit them due to time constraints. However, MVC4 in .NET4.5 has made it extremely straightforward to perform bundling and minification so there should be no more excuses. If you go to the Contents folder you’ll see a default CSS file called Site.css. Add two more CSS files to the folder to simulate tweaking styles: mystyle.css and evenmorestyle.css. For the sake of simplicity I simply copied the contents of Site.css over to the two new files but feel free to fill them with any other css content. Remember, we only pretend that we need 3 style sheets to render our website, we will not really need them. If you take a look at the Scripts folder it includes a lot of default scripts: jQuery, knockout, modernizr. We will pretend that our site needs most of them. As you see our page needs a lot of external files. You may be wondering why modernizr.js is included separately from the other JS files. The reason is because modernizr.js makes non-HTML5 compatible browsers “understand” the new tags available in HTML5 such as “section” or “aside”. Therefore it needs to be loaded before the HTML appears otherwise its effects will not be seen on the rendered HTML. You will probably know why JS files are included at the bottom of HTML code: if they come first then the browser will not start rendering the HTML until the JS files have been downloaded. By downloading them as late as possible we can increase the perceived response time. The version numbers of the jQuery files may not be the same as in your solution; I ran an update-package command in the package manager to have the latest version of each. It does not really matter for our discussion though so it’s OK to include the files that Visual Studio inserted by default. No surprises here: there is no bundling or minification going on here. The total rendering time in my case was 0.82 sec. If you go back to the summary view of the developer tools you’ll see in the bottom of the page that the total size of the downloaded content was about 0.9MB. 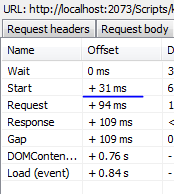 In my case knockout.js started to download 31ms after the original request. The tools needed to optimise our page are included in the References folder: System.Web.Optimization and WebGrease. WebGrease is a low level command line utility that the framework uses under the hood to carry out the minification and bundling of our external resources. Locate Global.asax.cs and check the code that’s found there by default. You will see a call to BundleConfig.RegisterBundles. Select ‘RegisterBundles’ and press F12 to go to the source. This is the place where the BundleCollection object is filled with our bundles. 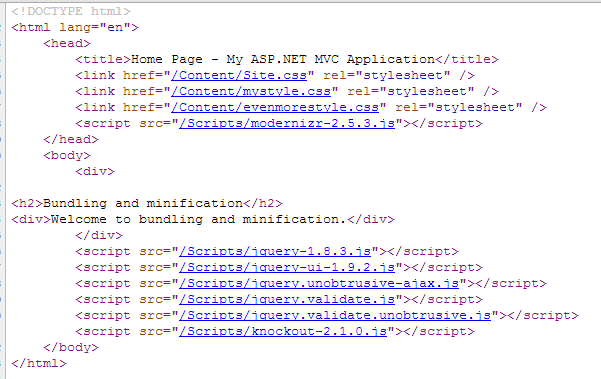 As you can see the MVC4 internet template builds some of the bundling for us. The bundle represented by the virtual path ‘/Content/themes/base/css’ will include 2 jQueryUi files. When the browser requests a resource with that path MVC will intercept the request, collect the contents of the files into one consolidated resource and sends that consolidated resource as response to the browser. – it understands the * wildcard. Example: “~/Scripts/jquery.validate*” will include all resources within the Scrips folder that start with ‘jquery.validate’. – it will not include redundant files. Example: you may have 3 files that start with jQuery. These are jQuery.js, jQuery.min.js and jQuery.vsdoc for VS intellisense. Include() will apply conventions to exclude the ‘min’ and ‘vsdoc’ files even if you specified with a ‘*’ charater that you want all files whose name starts with ‘jQuery’. Include() will only select the ‘normal’ jQuery.js file. This way we will avoid duplicated downloads. Next up is our JS files. You may recall that modernizr.js stands on its own before any HTML is rendered so we will build a bundle for that resource as well. You may be wondering why we want to have a bundle with one file and the answer is that bundling also performs minification at the same time. We’ll see how that works in practice later in this post. The ‘*’ wildcard will make sure that if we update this file to a newer version in the future the bundle will include that automatically. We don’t need to come back to this code and update the version number. -> We want all files starting with ‘jquery’ and the knockout.js file irrespective of its version number. The Include method will usually be intelligent enough to figure out dependencies: jquery.js must come before jquery.ui is loaded and Include() will ‘know’ that. However, it’s not always perfect. You may run into situations where you must spell out each file in the bundle so that they are loaded in the correct order. So in case your js code does not work as expected this just might be the reason. Now the browser will think the css file came from a file called “css” in the directory “content” and sends a request for “/content/images/…png” which will be the correct solution. You can still have e.g. ~/content/styles or ~/content/ohmygod as the virtual path but the folder name, i.e. ‘content’ in this case should correspond to where the css files are located. Following the same reasoning if you know that any of your JS files makes a reference to other files using relative paths then you will need to update the virtual paths of the ScriptBundle object as well: “~/scripts/js”. Let’s carry on: how do we render the script tags of those bundles? The optimisation framework will also add more information to the URL: a query string value that will avoid caching old versions of the bundle. If you update one of the files in the bundle then a new query string will be generated and the browser will have to fetch the new updated version instead of using the cached one. That looks better. The files have been bundled and the correct link and script tags have been created. Also note the query string mentioned before attached to the href and src values. As a result we have 1 link tag instead of 3 and 2 script tags instead of 7 we started off with. 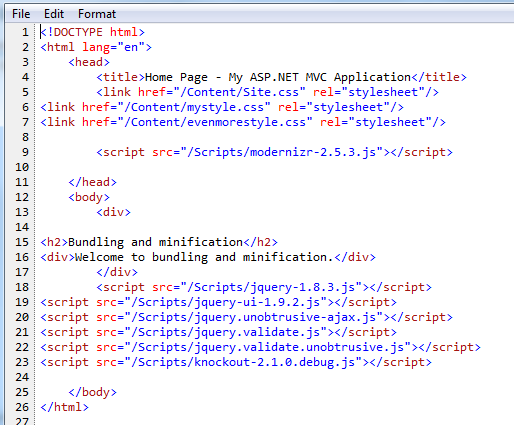 This will override debug = true in the web.config file and emit single script and link tags. You should see a jumbled version of the original modernizr.js file. Have we achieved any improvement in the response time? Run the same test with the web developer tool as we performed in the beginning. You should definitely get a lower response time. Also check the number of resources and the total size of the resources that the browser needs to download. The number of requests is reduced as we have fewer resources to download and the total size of the resources is greatly reduced due to the minification process. We achieved all this by very little work – at least compared to how you would have done all this manually. Some of you may have CoffeeScript files in your web project. You probably would like to bundle and minify them as well. I’ll demonstrate in the next blog post exactly how to do that.